"Shut up if you don't want to be killed!" - YouTube: " "
THE HAGUE, Oct 19 – Social media has been cited as an emerging threat to the identity of witnesses for the on going Kenya cases before the International Criminal Court. As confirmation of charges hearings got underway at The Hague-based court in September, Prosecutor Luis Moreno Ocampo raised concern about the posting of information about protected witnesses on the popular social media platforms Twitter and Facebook. “[Social media] takes witness protection issues [at international courts] to an exponentially more difficult level,” Luka Misetic, an international lawyer from the United States says. While the publisher of an article or book which contains confidential information can easily be tracked down and publication halted, the speed with which information on social media sites can travel and the anonymity granted the source can present serious challenges to the administration of justice. “With Twitter, Facebook and other types of social media, the information can travel instantaneously to hundreds, if not thousands, of different people, and be published both somewhat anonymously through various Twitter or Facebook accounts,” Misetic said. The violence that engulfed Kenya following the 2007 elections left more than 1,000 people dead and uprooted over half a million. The two cases before the ICC could see suspects from both sides of the power-sharing government – the Orange Democratic Movement, ODM, and the Party of National Unity, PNU – stand trial for crimes against humanity. Radio host Joshua arap Sang, legislators William Ruto and Henry Kosgey for the Eldoret North and Tinderet constituencies respectively, comprise the first case, known as Kenya One. They appeared for confirmation of charges hearings in the first week of September. Francis Mathaura, head of the civil service, Uhuru Kenyatta, deputy prime minister, and Hussein Ali, former commissioner of Kenya’s police force, make up the Kenya Two case. They appeared before judges between September 21 to 26. During the hearings, some people are said to have published the names and telephone numbers of witnesses on Twitter. “Even if we can’t for sure tell if these people are witnesses, there is a perception created by the [individual posting the information] that they are witnesses. For this reason, their family members and close associates can be targeted,” said Christine Alai, acting head of the International Centre for Transitional Justice, ICTJ, in Kenya. Disclosing information that has been classified as confidential by the court is a criminal offence and one which the court can prosecute under its laws governing contempt of court. “Whether it is by social media or by any other way, unlawful disclosure of confidential information may constitute an offence against the administration of justice, especially when the result has an impact on the security of witnesses,” ICC spokesman, Fadi el Abdallah, said. The offence can result in a hefty fine or even a prison sentence. Observers are particularly concerned about the release of information on protected witnesses as victims of the violence have reportedly been harassed in various parts of the country since the ICC opened an investigation in Kenya in March 2010. “There is a cause to worry because [of] the recent information we have been getting, particularly in Eldoret [in the Rift Valley region] where youths attacked an old man and a woman [apparently believing] that [the man’s] son is one of the witnesses who has been relocated,” Alai told Capital News. In a separate incident during the confirmation of charges hearings for the Kenya One case, a lawyer representing one of the three suspects described one of the prosecution’s protected witnesses as a “self-confessed criminal”. Another protected witness was described as a “liar” by the defence. Within seconds, thousands of Twitter users in Kenya exchanged information describing who the anonymous witnesses were, thereby putting those mentioned in danger. Observers believe social media in the context of the Kenya cases poses a new challenge for the ICC. A significant proportion of the Kenyan population have access to the internet while the highly political nature of the proceedings means the cases have attracted much greater attention domestically than the court’s other ongoing cases from the Democratic Republic of Congo, DRC and the Central African Republic, CAR. “The violence is relatively recent, and the dual power-sharing arrangement [between President Mwai Kibaki and Prime Minister Raila Odinga] which has been established obviously increases the scrutiny of proceedings at the ICC,” Misetic said. Dennis Itumbi, a Kenyan journalist who is an active Twitter user says the court should ensure the identity of witnesses is closely guarded. “Facebook and Twitter have created free communication; people can write anything they want; some have decided to use anonymous names which they use to pass dangerous information,” Kwamtcheshi Makokha, a Kenyan media critic, said. But certain users of social media appear to have abused the anonymity it affords, no longer caring whether what they post is within the law. “I fear that social media has created a gap that has given some users an opportunity to become mischievous abusing the very freedom [it provides],” Makokha added. However, tracking down and prosecuting those who break the law is hard. “Nobody nowadays can really control the source of information, so taking [a] Twitter user to court … is very difficult,” said Helen Hintjens, a senior lecturer at The Hague’s Institute of Social Studies in The Netherlands – although she insists that, despite the challenges, it is possible to prosecute someone for breaching confidentiality on social media sites. “Those involved in attacking.. witnesses….we will find them. We are working on these blog people, and we will get them,” Ocampo said. However, the nature of some posts, particularly those that are speculating on the identity of protected witnesses, cannot easily be prevented. While the ICC could request the Kenyan government to close down individuals’ social media accounts or bring contempt proceedings in The Hague, it may not be possible to initiate these measures as a response to potentially harmful speculation. “I think it would be too complicated to say you cannot have speculation on Twitter,” said Barbora Bukovska, law programme director at Article 19, an organisation which campaigns for freedom of expression. The global reach of the internet also means that prosecution of such offenders is not always straightforward. As with its arrest warrants for war crimes and crimes against humanity, the court would rely heavily on state cooperation to address unlawful online disclosure. The ICC can request state parties to the Rome Statute – the treaty underlying its foundation – to assist it in stopping the dissemination of confidential information and even to close down Twitter or Facebook accounts of offending individuals. Although not all countries are members of the ICC, legal experts say that based on a legal precedent at the International Tribunal for the former Yugoslavia, ICTY, the court could exert global jurisdiction for matters of contempt of court. However, the ICC may run into difficulties when trying to execute an arrest warrant for contempt if the country concerned does not wish to cooperate. The most effective way to prevent disclosure of confidential information is obviously to ensure it does not leak into the public domain in the first place. But this is exceedingly difficult to do. International criminal cases require a lot of investigation by high profile lawyers who need to question a number of different witnesses that will be presented by either the defence or prosecution. It is impossible to conceal every meeting and the movements of all witnesses involved in a particular case. “When you are investigating a particular [protected] witness, out of necessity you have to interview people about that witness,” Misetic said. The first contempt case at the ICC, whenever it takes place, would serve as a major deterrent for future publication of confidential information. However, until that point the best remedy would seem to be to ensure that confidential information, or anything that could lead to mass speculation via social media sites, is not leaked. Judie Kaberia is an IWPR-trained journalist in Nairobi. This article was produced as part of IWPR’s international justice training programme for Kenyan journalists that was held in The Hague. 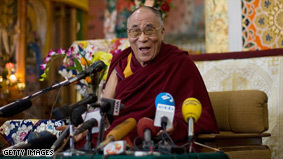 South Africa has refused the Dalai Lama a visa to attend an international peace conference in Johannesburg this week, a presidential spokesman said. The Dalai Lama's fellow laureate, Archbishop Desmond Tutu, said he would boycott the event. Birthday Greetings to Archbishop Desmond Tutu - YouTube: " "
I want to request that you do all within your power to safeguard the life and well being of a large number of leaders, members of opposition parties and prominent figures in prison that include Mr. Debebe Eshetu (actor), Mr. Wubeshet Taye (Editor Nnewspaper), Mr. Bekele Gerba (political leader), Ms. Reyot Alemu (columnist), Mr. Eskendir Nega (journalist), Mr. Oblana Lelisa (political leader) Mr. Andualem Aragie (political leader), Mr. Zemenu Molla (political leader), Mr. Natnaiel Mekonnen and Mr. Asaminew Birhanu (political leader), and two Swedish journalists. I demand the unconditionally release of all political prisoners in Ethiopia.